This clock was kindly supplied by Millclock for review, so many thanks to them for sending the clock to me. Previously we reviewed one of the simpler clocks produced by Millclock (the IN-12 Walnut clock) and this time we're looking at the other end of the range. The power supply has a slightly smaller than usual jack, but is a standard DC jack, and has quite a short lead, but I'm sure that you can find a supply with a longer lead if you need it. For most purposes, the lead supplied will be adequate. The unit has GPS time synchronisation, meaning that it keeps good time. The GPS antenna unit has a very long lead on it, meaning that you can easily and unobtrusively mount the antenna in the vicinity of a window, which is a pre-requisite for good time synchronisation. The pitch of the tubes is quite tight, with only about 1mm between adjacent tubes in the digit pairs. This gives the clock a very "upright" appearance, especially because of the relatively large base height. The mixture of the black acrylic and transparent acrylic base work well. One slight improvement that I would suggest to Millclock: It would be good to have some rubber feet on the bottom of the acrylic base: acrylic scratches easily and the beautiful finish will deteriorate quickly if it is left as a raw acrylic on any hard, rough surface. The clock arrived very quickly and was well packed,with no damage to the unit at all, and with very little risk of being damaged, even given the fragile nature of the IN-14 tubes and the fairly large size of the assembled clock. The box it came in was a sturdy "Ukraine Post" official box, and priority postage was used. Note that the cost of the postage is in the price. The first thing to say about the Nixie Six is that it works well, keeps time reliably, and is in no way "needy". I have been using it for a couple of months, and it has never put a foot wrong. It's totally silent in operation, and has been a "fit and forget" experience. The GPS unit means that it tells the right time and you won't need to fiddle or adjust the clock at all. Even changes to Daylight Savings Time (DST) are automatic if you are in Europe or the US, or in a country that follows either of these DST change standards. The GPS time is backed up by a battery powered Real Time Clock (RTC), and so the clock can run even there is currently not any GPS signal available. As with all GPS devices, it can take a couple of minutes to sync the time the first time, because the inbuilt GPS receiver has to understand where it is, and which of the GPS satellites are in the sky above it. If you don't have the GPS version, there is the possibility to fine adjust the RTC unit, in units of about 5 seconds per day. RTCs are usually very accurate, but even these can drift over time or under certain circumstances, and the adjust feature allows you to correct this. 7 - "ping pong alternate": As "ping pong" but the bias changes each second (alternating between left and right bias). This clock won't give you "feature overload", the ones the clock offers will cover the vast majority of user wishes, and you won't have to get exasperated by wading through the manual to fine what you want. It is mostly very intuitive. Millclock didn't know that I was going to tear the clock down, but I think it is worth having a look inside it to see what you are getting. In general, if you are scared to have your clock torn down, then don't send it in! The case comes apart quite easily and non-destructively, meaning that it will be a fairly simple task to change the RTC battery if you need to in the future. The clock itself is a two board design, one board housing the driver, and the other board holding the tubes, the separators and the RGB back lights. The internals are really clean and professional. The board is well laid out, logically divided and neat and tidy. The tubes are all perfectly aligned, and have been clearly inserted using a jig, or by someone with a good level of skill. The clock uses an STM32F103C8 controller, which is a powerful ARM Cortex-M3 device with 64kB of flash and a maximum clock speed of 72MHz, but in the case of this clock, it is using it with a 32.768kHz external crystal for the inbuilt RTC and probably uses the internal RC oscillator running at 8MHz for the control circuitry. The RTC consumes just 1.5uA when the clock is off, so a standard CR1220 battery with a capacity of 36mAh will last about 24000 hours, or about 1000 days. However, the 32.768kHz crystal is not temperate compensated, and therefore the need for the RTC calibration. I would complain about this if the clock did not have the GPS antenna, but it does have GPS, and is unlikely to give you any problems in practical use. The display is multiplexed using a K155ID1, and uses classic NPN-PNP discrete drivers for the anodes, using SOT-23 transistors marked 1D (NPN) and 2D (PNP), presumably the MMBTA92 which has a voltage rating of 300V, or the KST93. The tubes are mounted close to the display board, with just enough clearance under them to allow the SMD 5050 RGB LEDs to be mounted. The RGB LEDs, which are divided into three sets of two RGB LEDs, one for each pair of digits, using NPN transistors marked 1GW, which is a general purpose SOT-23 NPN transistor. Millclock are following a strategy which I think is the right for them to build a brand over the long term: Offer high quality items at the price which allows you to guarantee the quality. Millclock clocks are not cheap, but if you want to have a no-nonsense, "get-it-done" clock, you will not be disappointed if you buy Millclock. 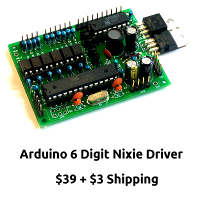 Buyers of luxury items (and let's face it, Nixie clocks are luxury items: a $3 LED or LCD clock will tell the time just as well) forgive the price if the quality is there, but will not forgive failure and unreliability. From this point of view, I think Millclock are on the right path, and the Nixie Six is good choice. Millclock offer a one year warranty, and will give you a 10% discount if you mention this article!